As a visual artist usually based in London, the opportunity to spend 3 months away concentrating on my own practice in a city as visually and culturally stimulating as Liverpool was an exciting prospect. The scene was set from the beginning with a rather surreal and magical initiation to the city. I arrived to a day of horizontal snow and when I ventured out to try and find the Mersey in what seemed like a bit of a blizzard, I felt as if I was walking through a still from a New York movie or a Whistler painting. 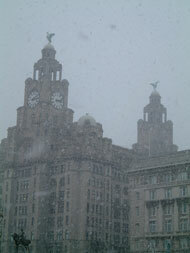 The Liver Building was veiled by impossibly giant snowflakes and the river and usually distinctive skyline were almost invisible and indistinguishable from each other. This theme has continued through my residency with an interest in making work that explores transparency and obscurity. 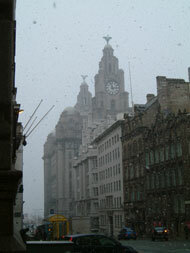 Looking back at the Liver buildings with snow on 2nd Feb. The open remit for the Adam Reynolds residency allows valuable time and space for experimentation and development of work without a prescribed outcome. After an initial flurry of meeting people at the Bluecoat and the Tate, local radio and open studio, and getting lost just about every day for the first two weeks, things settled down to their own rhythm. 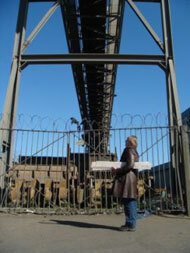 I had the time to explore the city, wear out my walking boots, and think about what work to make at my own pace. One of the main things I wanted to do during my time in Liverpool was to make work directly inspired by my experience of the city itself, and the studio at the Bluecoat. I have used these to explore light, and incorporate transparency and obscurity as part of my drawing practice and the way that I see. 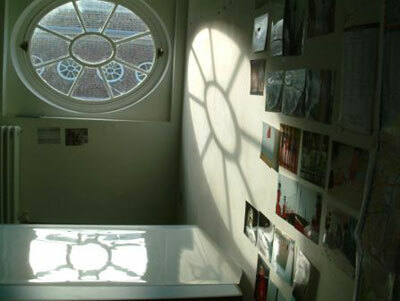 In the studio I have taken a series of photos of the light and shadows cast by the oval windows, both at night and in the afternoons. As the days slowly lengthened, and glimpses of developing work appeared in the background, this has reflected the passage of time over the course of the residency. Studio windows photo montage. 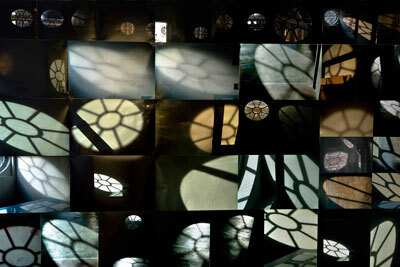 A selection from a series taken of shadows, reflections and changing light inspired by the oval windows in my studio over the period of the residency 160cm x 245cm. With a home made idea for a washing line system erected in the studio, I have experimented with making transparent drawings in a number of layers, which has developed my previous practice of drawing on acetate. In a quest for a building with a panorama, I spent many windy and not too successful days trying to draw from the top of the tower of the Anglican Cathedral, in the company of Frank, who sits in a hut up there. Back down at sea level I had strategies for dealing with the weather for drawing on location. 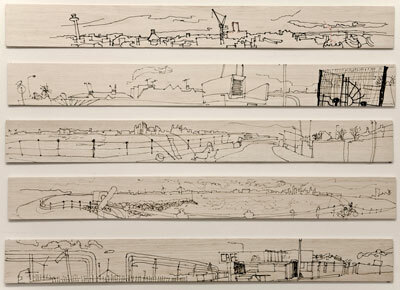 I made a collection of long balsa wood drawings (light and portable - a new discovery) in collaborative excursions to the docks with an artist who uses mobile phone photography, and compiled an acetate sketchbook for drawing on the bus when it rained. Over the course of the residency I spent time getting to know staff and artists at the Bluecoat and the Tate and using the facilities available. This included a trip out to MIMA with staff to see the drawing show, meeting and working alongside the participation team, time spent in the print room experimenting with monotypes and learning new print techniques, meetings with Lindsey Fryer at the Tate, and attending and participating in events and workshops, such as Explore. 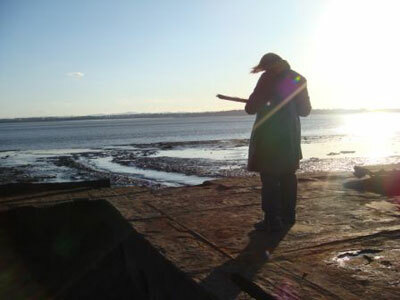 Sally drawing on site at the docks, and examples of work below. 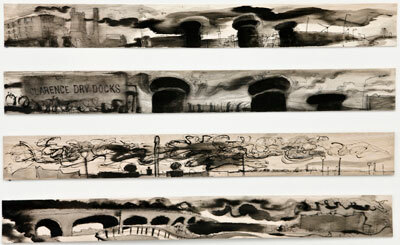 North dock adn the canal, 4 pen and ink wash drawings on balsa wood 10cm x 92cm. Allerton Towers. 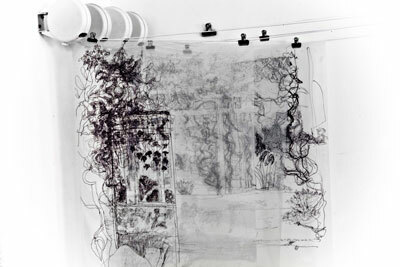 3 layered transparent drawings made on location, pen on acetate on hanging rail 127 cm x 91 cm approx. 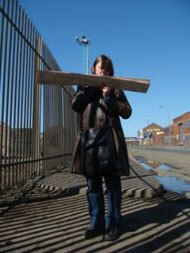 To find out more about my participatory projects and workshops. To discuss running workshops or residencies contact me.